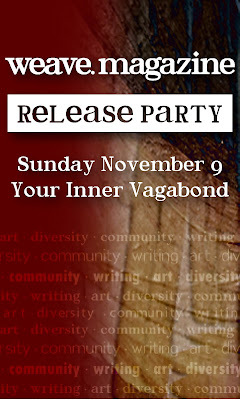 Between Liberties and Weave Magazine Celebrate on Nov 9th! Weave Magazine is very pleased to announce that our release party will now feature a musical performance by Between Liberties. Between Liberties rocketed onto the scene in Pittsburgh late in 2007, quickly garnering a dedicated underground following with emotionally charged songs that surpass their years. The event is being held November 9th at 5pm at Your Inner Vagabond in Lawrenceville, PA.
We are so honored to have Between Liberties as part of our celebration for the first issue of Weave Magazine. This party promises to be a magical evening filled with music, art, poetry and of course, excellent company that we hope includes you! If you haven't already, be sure to RSVP to our Facebook event. Here is a lovely music video performance by Between Liberties. Michelle Stoner’s first book Flats and Riots is a provocative journey that is both political and personal. A quick flip through the pages of this book and you’ll see that Stoner is most comfortable with a brief style, with most poems averaging less than ten lines. But it is her brevity that makes each poem so hearty; each word, phrase and line break is carefully crafted so the reader follows her through both the “flat” and the “depth” of each poem. you go West, you try. Flats and Riots is a powerful and moving book of people, places and things. Whether commenting on sexual politics or expressing homesickness, Michelle Stoner’s Flats and Riots delivers an emotional (and sometimes physical) punch-in-the-gut that will make you laugh, cry and think all at once. Flats and Riots by Michelle Stoner was published by CustomWords in 2008 and can be purchased via their website. Forms of Intercession by Jayne Pupek is a collection as unsettling as it is beautiful. In (I) Forms of Intercession, the first of three sections in this imagistically dense, narrative work, we are introduced to gentle-seeming female narrators with a desire for an almost violent rebellion. The women (or woman) in these poems are aware of a magical property in their own bodies, watching the lifeline in their hands deepen or making a potion of hair and feathers with a sense of both longing and simultaneous understanding. This, combined with the sexual, but not at all titillating element the poems often take on, gives the characters in them a shamanistic, earth-mother quality. “Set in fields, poppies survive. Perhaps it’s the same with a woman. This section shifts to a tone of uncertainty and doubt, even fear as Pupek’s narrators, always in the intimate “I”, speak of cheating spouses, of children dead of stillbirth, infanticide, or abortion, always with a hauntingly beautiful voice and the ear for soft, low sound that Pupek maintains throughout the book. Forms of Intercession by Jayne Pupek was published by Mayapple Press in 2008 and can be ordered from them or on amazon.com. Jayne Pupek's website may be found here. She has also recently published a novel, Tomato Girl, which may be found here. We are very pleased to announce that we have published some sample works from Weave's premier issue on our website. Our contributor list has been updated to include the titles of all pieces being published in issue one. 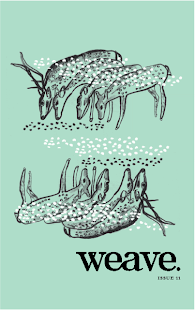 We have included fantastic poetry from both Molly Prosser and Dana Guthrie Martin. For fiction, we do hope you'll enjoy Jack Swenson's piece as much as we do. For artwork, be sure to check out the lovely Nashay Jones and the amazing cover art by Heidi Richardson Evans. We are so very excited and honored to include all the work of our contributors and we do hope that these samples will whet your appetite for a bigger taste of what's cooking in Weave's first issue. We also hope that if you are considering submitting to Weave for consideration in future issues, that you'll take a gander and these pieces to gain a clearer picture of our aesthetic. We will soon be open for pre-orders for issue one and will thank you in advance for your support. Be sure to check back - or better yet, sign up for our mailing list or subscribe to our blog (see right side column). That will ensure you have the latest news for all things happening with Weave.